– Texas Motor Speedway was a new track for Pigot, who is competing in a full Verizon IndyCar Series season for the first time this year. After sharing the No. 20 with team owner Ed Carpenter the past two seasons, the 24-year-old was elevated to ECR’s full-time driver of the No. 21 Fuzzy’s Vodka Chevrolet for 2018. Though Saturday night was his first race at Texas, he has tested the No. 21 at the high-banked oval twice. – The first and only practice session prior to qualifying took place early Friday afternoon with hot and windy conditions throughout. The first half an hour was dedicated to scuffing tires for Firestone and was then followed by an hour of open practice. Pigot’s quickest lap came in at 216.261 miles per hour on his 70th of 72 practice laps. – The starting lineup for the DXC Technology 600 was set by the average time of each driver’s two-lap run. In a new rule for 2018, qualification order for oval events is set in reverse order of entrant points. Pigot was 6th out to qualify and turned an average speed of 216.895 miles per hour. The bright green No. 21 would start the 248-lap race from the 18th position. – An hour-long final practice session finished out the day on Friday. Pigot did not focus on outright speed; instead, he used session to work on his race setups and the handling of his cars in traffic. Pigot turned 73 laps in the final hour of practice, giving him 145 laps on the day – over half of Saturday’s race distance. – When the green flag fell, Pigot went three-wide and gained two positions on the opting lap. The first yellow came out on Lap 7 as Matheus Leist’s car ignited and rolled to a stop in Turn 3. Pigot used the early yellow as an opportunity to dive into the pits to top off on fuel and get a fresh set of Firestone Firehawks. After his pit stop, he was back in 18th, his original starting position. – As Pigot had stopped under the first caution, he cycled all the way up to third before his second stop on Lap 71. However, with cars who had already stopped so close behind, Pigot lost a lap on his pit stop and fell to 18th again. On Lap 123, race leader Robert Wickens passed Pigot, dropping him two laps behind the field. After Pigot’s third pit stop on Lap 130, he was 16th. – When teammate Carpenter made his pit stop, Pigot moved in front of him to the 15th position. After Carpenter was retired from the event, Pigot was 14th. Pigot used the caution period to make a pit stop on Lap 182, maintaining his 14th place position. The final yellow flag of the race flew on Lap 205, eliminating two more cars from contention and moving Pigot up to 12th. – Pigot became the beneficiary of a wave-around, getting one of his laps back. He came in on Lap 213 for a fresh set of tires and splash of fuel to finish the race. Pigot was then on a lap with only Charlie Kimball and Max Chilton. Pigot was quicker than Ed Jones, a lead lap car in between himself and Kimball, and worked around Jones with 13 laps to go. Though he gained on Kimball every lap, not enough time remained for Pigot to catch all the way up to Kimball. 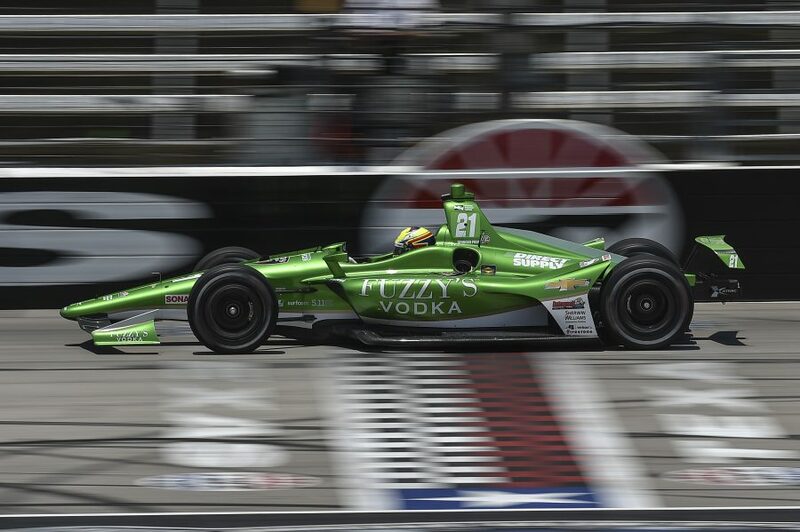 Pigot would finish 11th in his very first race at Texas Motor Speedway. – Pigot’s Ed Carpenter Racing team will get their first break in many weeks as the Verizon IndyCar Series has an off-weekend next weekend. Pigot will be back in the No. 21 car, carrying the colors of Direct Supply, for the KOHLER Grand Prix at Road America on June 24. Copyright 2018 P1 Management, LLC. All rights reserved.